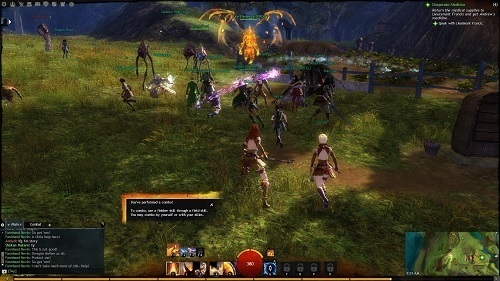 Guild Wars 2 (GW2) falls under the massively multiplayer online role playing (MMORPG) umbrella and is one of the biggest competitors to the long standing and popular MMORPG of World of Warcraft (WoW). As of early 2013 purchases had been quoted at over 3 million copies making it one of the leading games in the genre. In late 2015 the core game went free to play with expansions released afterwards requiring purchase. Once players purchase these full expansions the full game is available without subscription (just like the base game), they can access all the game content although Gems can be bought with real money and used in the Gem Store for convenient related items and services. This premium currency can also be obtained by trading Gold though so Guild Wars 2 should definitely not be considered a pay to play or pay to win MMORPG. Guild Wars 2 shares a similar setting to many of the other big MMORPGs and puts players in the midst of a fantasy world known as Tyria. The main appeal to Guild Wars 2 over other similar MMORPGs and World of Warcraft clones is the ever evolving game world which attempts to react and be responsive to actions made by players or the player base. Combat is also a more engaging experience than other games within the genre but still offers plenty of depth with profession synergy and environmental features playing a role in combat. 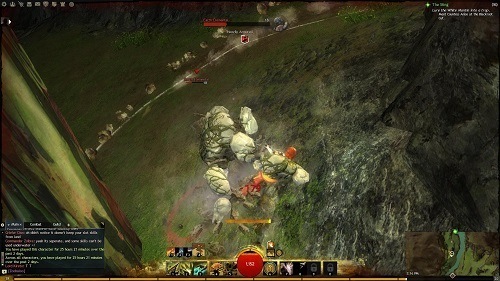 Guild Wars 2 offers amazing 3D graphics and detailed environments that feel fresh in the saturated MMORPG genre. This combines beautifully with the fluent character animations to give the game a visual appeal beyond its solid gameplay. The visuals are definitely some of the best you’ll get in this space. Everything else that makes a great MMORPG is also there with skill selection, PvP, an engaging story, crafting, quests and lots more. Guild Wars 2 is much more than your standard game though, every aspect of the game has been designed and put together brilliantly to create one of the top MMORPGs with just the right touch of innovation. Large amount of content to explore. Premium currency (Gems) can be obtained with in game Gold. Great balance of genre innovation and good old MMORPG action. Friendly to MMORPG veterans and newbies.